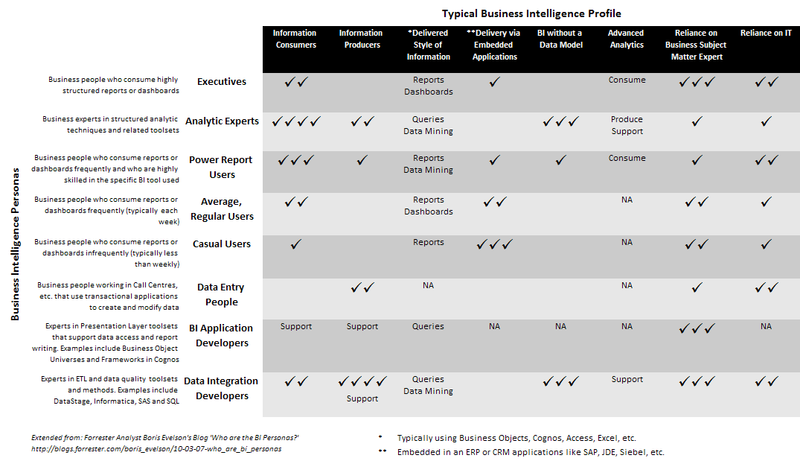 Boris Evelson of Forrester has recently published a matrix of ‘BI Personas’ on his blog. As he says, this is his first attempt – but the concept struck an immediate chord with me. The matrix is trying to present on a single page a view of the many different dimensions of BI creation and use that exist today. I am a strong advocate of making business subject matter expertise a critical dimension in any BI capability. It delivers a huge analytic punch that contributes directly to the amount of insight (and thus value) a business gains. BI and Data Integration developers rarely span both skill sets although if money is tight I will go with hiring a data integrator everytime. In this case, the BI Application Developer role is often wrapped into the Power Report Writer role as they are the ones who best understand the very specific requirements of vendor-specific constructs such as Universes and Frameworks (see persona definitions below). Medium sized businesses will undoubtedly see a collapse in the number of roles (rows) they have. Differing levels of IM maturity will have a similar effect on the number of dimensions (columns). I hope this helps people communicate the complexities of modern BI activities. If you have comments (good and bad) and ideas to improve the matrix then please contact me. Please note that Boris is the originator of the model so he gets the credit. Any errors in the above I proudly own alone.